David Trotter: "When we harvested, you always went round the field first - not like when you were mowing grass, when you went round to the left and mowed it off, and then the lad come and took this little back bit the other way on - now when you went in with harvest, you never did that. "We used to go first of all right round the field - there would be the banking here - and we used to go with one sweep - all the way round it with the ley. You pulled it up to a sheaf, and took a bit and wrapped it round and tucked it under. So when the binder came in with the horses, it had one straight run at the field." The cradle caught the sheaf as it was cut and made the job of tying up easier. It could be removed for more mundane tasks like topping thistles in pastures. 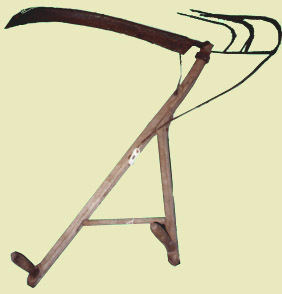 This model of scythe is an uncommon one, being made of several pieces of wood, where the S-sned and straight-sned scythe are all of a piece with only the handles added. "It is not unusual to hire labourers by the month of four weeks at the rate of £1:12:6 plus victuals. They breakfast on milk-pottage, and bread and cheese; have a pint of good beer morning and afternoon, dine on meat boiled, baked or roasted, and potatoes or pudding; sup on cold meat and have plenty of common beer to drink during the day. They begin in the morning as soon as the corn is dry, rest but while at meals, and continue as late as they can see to work. Four men may cut, tie and stook a customary acre a day, leaving a stubble from nine to fourteen inches in length."